Please see attached image, I just noticed the host on the left of the Engine oil cap was broken. The car drives ok except smells oil. What is this host for, and is the car dangerous to drive with it broken? Thanks a lot in advance! That's the PCV breather hose and no, it isn't dangerous. Thank you ES6T! What is the skill level to replace the host :-) ? I can do them in about 5 minutes. But I'm a professional and have done hundreds. Shouldn't take more than an hour for an average Joe. I would fix it as soon as possible, because if you don't oil will leak into your upper head area getting your coils and plug area all oily, and if enough leaks up there it will most likely leak down into your timing belt area and could throw a timing belt if enough oil runs down into the timing belt crank gear area. 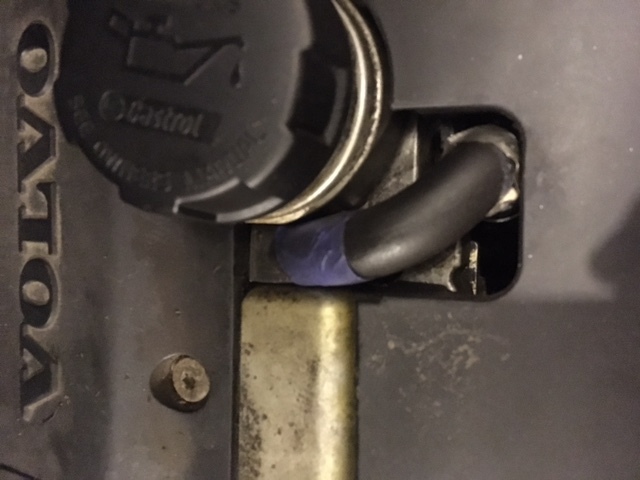 It's not hard to replace it, just remove the plastic cover covering your ignition coils, un-clamp it on that upper end, then loosen the inter-cooler pipe under the intake-manifold that is connected to the throttle body to give you room to pull the other end of that hose off the oil trap. Cruise Control Vacuum hose broken!